It was one year ago that lightning struck and ignited the Yarnell Hill Fire, a devastating wildfire that resulted in the deaths of 19 firefighters who were members of the Granite Mountain Hotshots. This year, a combination of drought conditions, high winds and high temperatures all call for an intense fire season. Predictions indicate above-normal fire potential, and indicators suggest the onset of the monsoon season will be delayed. Since October, we've had very low precipitation – averaging less than half of average across large portions of the state – accompanied by low snowpack and temperatures that have been well above average. The combination of these factors, along with bursts of dry winds that are typical for the spring, gives us conditions of above-normal fire potential, which is what the Southwest Coordination Center, the main fire prediction center for our region, predicted beginning in late January. 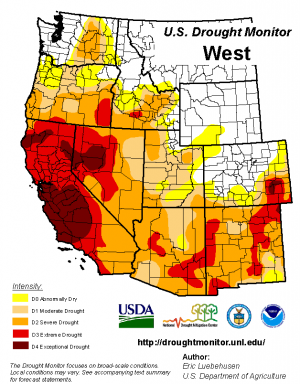 And the setup for this year's fire season is ongoing drought, which affects every part of the state. The U.S. Drought Monitor characterizes drought in Arizona as severe across most of the state, and as extreme in Yavapai County and much of the southeastern quarter of the state. As of June 24, Arizona wildland fire totals, not including prescribed fires, were 139,378 acres from 783 human-caused and 50 lightning-caused fires. The total acres burned thus far exceed the median acres burned for the state for the whole fire season. In southern Arizona, we are just past the median date of peak seasonal fire danger, but the date can vary by two weeks in any given year. Peak seasonal fire danger for northwestern Arizona, including Yavapai County where the Yarnell Hill Fire occurred in 2013, is right now – June 30 through July 1 – according to maps provided by the Southwest Coordination Center. And, earlier this year, the Southwest Coordination Center predicted above normal fire potential for mid-May through mid-July, for the southeast quarter of Arizona, stretching northwest into Yavapai County. The current "energy release component," which indicates how hot a fire could burn, is very high and is above 2013 levels across much of Arizona. This is just one measure of fire danger commonly used by fire analysts, expressing the potential intensity of a fire given the moisture content of fuels. While it is not surprising at this time of year to see high short-term fire danger and above normal long-term potential for Arizona fires to require extra outside resources, such as air tankers and teams with highly specialized skills for fighting fires for putting out fires – this year's levels of fire danger are exceedingly high. Any fire is devastating to the local community, and Arizona fires can have a lingering effect on the landscape, with post-fire effects such as flooding and debris flows. It is notable that we have not suffered an enormous Wallow or Rodeo-Chediski sized fire. The Slide Fire, which burned in Oak Creek Canyon in May and early June, was severe and it occurred in very steep terrain, which increases the chances of post-fire impacts. It is a testament to the fire-fighting community and its heightened preparedness for this year's fire season that the Slide Fire did not consume even greater acreage than the 21,227 acres burned by the fire. Looking ahead, the arrival of summer monsoon precipitation is the key to putting a lid on Arizona's high fire potential. However, the monsoon is notoriously difficult to predict. And predicting the arrival of the monsoon is even more difficult. Nevertheless, the Southwest Coordination Center predicts a delay to the start of the monsoon. Based on comparisons with previous years that had conditions similar to 2014, the Coordination Center predicts more reliable monsoon rains east of the Continental Divide, in New Mexico. Center specialists also note that less reliable moisture on the Arizona side of the divide can lead to the possibility of continued significant fire activity into July and possibly August. See tips on how to prevent wildfires in this post.